Preheat oven to 350°F. Whisk egg yolks and 1/3 cup sugar in large bowl to blend. Pour cream into heavy medium saucepan. Add vanilla. Bring cream to simmer. Remove from heat and whisk hot cream mixture into yolks gradually. Spoon custard mixture into another large bowl. Transfer just 2 cups custard to medium bowl. Immediately while the custard mixture is still very hot add grated chocolate to remaining custard in large bowl and whisk mixture until chocolate melts and is thoroughly blended. It is important to use the very best chocolate to get the best tasting chocolate mixture. Don't skimp, or you will taste the difference. Divide chocolate custard equally among eight 2/3-cup ramekins. Place ramekins in large roasting pan. Pour enough hot water into roasting pan to come halfway up sides of ramekins. Bake until custard is barely set in center, about 25 minutes. 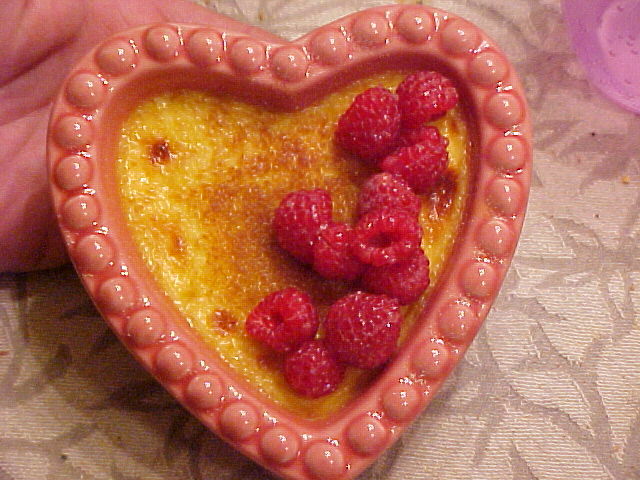 Transfer ramekins to baking sheet and refrigerate until tops of custards feel firm, about 30 minutes. Maintain oven temperature. Spoon vanilla custard evenly over chocolate custard, dividing equally among ramekins. Place ramekins in large roasting pan. Pour enough hot water into pan to come halfway up sides of ramekins. Bake until vanilla custard is barely set in center, about 35 minutes. *Williams Sonoma's vanilla paste is very good and works as well as a real vanilla bean in recipes of this sort. You can substitute a vanilla bean if you wish. Scrape the insides into your custard mixture before cooking and then let the bean cook in the mixture if you opt to go this route.